Lately artist Jeff Jacklin published a new, the fifth issue of his „Hearts & Iron“-Comic. It continues the „Entwined Lives“ story-arc he began with the last issue and tells about the muscular athletes Kallikrates and Ioannes in the times of ancient greece and its myths. The love of the two men has to face some challenges – on earth as well as in the underworld. 2001 the first issue of „Hearts & Iron“ was published. But the two main characters John Sullivan and Carl Hanson had their debut a few years ago – in 1998 in „Gay Comics“ No. 25. In „Hearts & Iron“ 1 Jacklin tells how they first met and fell in love with each other. No. 4 makes, after a brief introduction scene with Carl and John, a kind of mystic jump through the ages to reveal that Carl and John had predecessors Kallikrates and Ioannes, They were shown as strong athletes whose competitions were watched by the gods. The immortals always find new challenges to test power and love of the two men – which finally results in a catastrophe that leads the two lovers down to Hades – the greek mythology has a lot of stories where love has to be tested in the realm of death! Clever how Charon the ferryman and the lord of death are tricked out in Jacklin’s version! While in the adventures of Carl and John the tension is greated by a homophobic threatening (first subtil when Carl and John belief they have to hide their feelings from supposed to be straight men, i.e. in the gymn, later openly when they were attacked by a fanatic killer), the tension of the „Entwined Lives“ story-arc rises when the gods start to play their games with humans. The homosexuality of Kallikrates and Ioannes is no topic in Jacklin’s vison of ancient greece. It is accepted – „naturally“. That may be the myth of greek culture – besides: it is a myth! Even if it is a nice one! So Kallikrates and Ioannes don’t have to deal with the problem of anti-gay feelings like Carl and John had to. 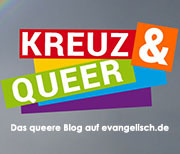 Yet it is one of the most interesting aspects of gay life: How can a gay couple that favours a certain ideal of manly masculinity fit in a heterosexual society as well as in a homosexual community. Instead: The ancient heroes are pretty busy to get along or out of the mess the gods have inflicted on them. They never mind to challenge the reign of the gods – what would have been a possible aspect of greek mythology, too. Think of Prometheus! Jacklin’s art stands in the tradition of american (superhero) comic culture, with a clear line and a clear structure of the pages. From time to time the single panels are interrupted by outstanding single drawings (so when the olympic gods gather to watch the games). It’s typical that Jacklin only in the fighting scenes between his two main characters allows himself to break the frames of the panels that have become to small for the action. While „Hearts & Iron“ No. 1-3 show often a strong contrast of black and white areas – I like that touch of „crime noir“! – the black-white contrast is less obvious in the next issues – Jacklin starts using grey / dark shades giving the bodies a certain plasticity. Maybe Jeff Jacklin is one of the last of his kind who believes in romance, romatic sexuality and honest friendship between men. He is man enough to show it in his art. I really appreciate his almost naiv and sentimentalistic (in a way Friedrich Schiller defined sentimentalistic) approach to love among men without ending in fantasies of men being allmighty superiors (the „Fight Club“ movie might be an example where that could lead to). We will see how the artist is defending his position in the future. (And I hope he will!) Meanwhile he announces at the end of „Hearts & Iron“ 5 that the mystic travel will lead us to the age and time of vikings and celts. I guess we can expect muscular wild men fighting the icy cold northwinds not without some warm tenderness – both sides mark the art and the stories of Jeff Jacklin! 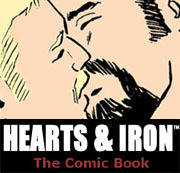 „Hearts & Iron“ 5 is available as digital comic (PDF) for 4 $ on the Hearts&Iron-website.